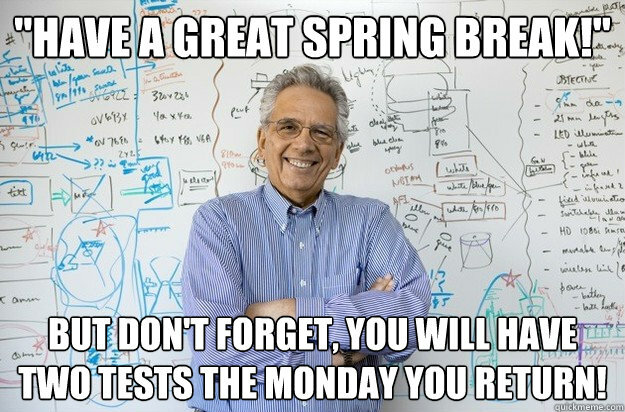 I hope everybody had a great spring break! I also hope you’re all ready to turn in all the papers/present all of those group projects that are conveniently due the day we return. We knew it would be a hard week back, so we have two ECO events to ease the pain! We will only have 12 available desktop computers for people to use for the training. If you own a PC laptop, I repeat a PC laptop (not a mac), you can use that for the training, but you will need to download the ArcGIS program (it’s free) a few days in advance for the licensing to come through in time (or something like that). Please download the software here if you’re planning on using your PC laptop. There are 3 sign up lists. (1) A list for people who will need a desktop. There are 12 available slots. (2) If that list fills up, please add your name to the waiting list in case we have people drop out. (3) If you’re planning on bringing your PC laptop, add your name to the third list. If you have any questions, please feel free to email me at lmc2248@columbia.edu. Volunteer with ECO at Sure We Can! What is Sure We Can? Sure We Can is a non-profit recycling center, community space and sustainability hub where canners, who are people that collect cans and bottles from the streets, come together with students and neighbors through recycling, composting, gardening and arts. For over 9 years, Sure We can has supported canners, this activity helps them keep a roof over their heads, provide for their families and also reduces the amount of cans and bottles heading to landfills. From collection activities to education programs Sure We Can is promoting social inclusion, environmental awareness and economic empowerment. Spend time with our community of recyclers and help us sort and count the cans and bottles. We might also work on the composting program, bagging our locally made compost. Contact your volunteer day coordinator, Mrig Mehra (msm2238@columbia.edu), to let him know you can attend! Save the date and bring comfortable clothes that can be dirtied. ProPublica has just published a list of more than 400 officials quietly installed at various federal agencies by the Trump administration. The list includes many former lobbyists, Trump campaign staffers, and others who have expressed deep skepticism about environmental regulation and climate change. The Sabin Center would like to bring more public attention to these appointees by publishing profiles of the officials installed at the Environmental Protection Agency, Department of Interior, Department of Agriculture, and other agencies that deal with environmental matters and natural resource management. Their goal is to inform the public about the political positions and possible conflicts of interest of these appointees. They are looking for student volunteers to help us with this project during or after spring break. If you are interested, please contact Jessica Wentz, jwentz@law.columbia.edu. Please find slightly more information here. Please join the Center on Global Energy Policy’s Women in Energy program for a panel discussion on energy insecurity. Energy insecurity is a conceptual framework that describes the interplay between the physical conditions of housing, household energy expenditures and energy-related coping strategies among low incomes groups in the United States. Defined as an inability to adequately meet basic household energy needs, this panel will outline the key dimensions of energy insecurity-economic, physical and behavioral- and related adverse environmental, health and social consequences. Implications for policy and advocacy will also be discussed. The densely populated, low-lying river deltas of Vietnam and Bangladesh are acutely vulnerable to floods, cyclones, and sea level rise, hazards that have placed both countries among the top 20 states most threatened by the impacts of climate change. The widespread notion of “common but differentiated responsibilities” accounts for the disproportionate contribution industrialized states have made to climate change and compels them to mobilize finance to help developing countries like Vietnam and Bangladesh adapt to emerging hazards. However, several prominent public and private institutions within industrialized states have reconfigured climate hazards in Vietnam and Bangladesh as lucrative investment opportunities, thereby casting into question climate finance as a mechanism for administering climate justice. Sustainable Energy for ALL (SEforALL) is a global platform that empowers leaders to broker partnerships and unlock finance to achieve universal access to sustainable energy, as a contribution to a cleaner, just and prosperous world for all. We connect stakeholders, marshal evidence, benchmark progress, amplify the voices of our partners and tell stories of success. This April we will host our 3rd Sustainable Energy for All Forum at the Duggal Greenhouse in Brooklyn, New York. Sustainable Energy for All is looking for dynamic and highly motivated volunteers to join our 2017 Forum Team. Responsibilities will include general on-site event support. This is a unique and rare opportunity for those interested in sustainable development and the role of energy. Volunteers will be an integral part of this exciting international event that will convene world leaders advancing the achievement ac- tion on SDG7. Time Commitment: Minimum 2-day commitment. Please contact Cécile Bélivent cecile@seforall.org for additional information. To learn more about the Forum, visit www.seforallforum.org. If you wish to apply, please click here.